We introduce option spread strategies in this module. Options spreads sit right in between the 4 basic Option positions and the more Advanced level Option strategies. The Spread is the bridge between the basic Option strategies and the advanced strategies. In fact, most advanced strategies are composed of the spreads we cover in this course, so this stuff is the key. For the busy professional, Spreads offer the right mix of reward and risk. All 4 vertical spreads introduced in this course are extensions of the 4 basic Options. 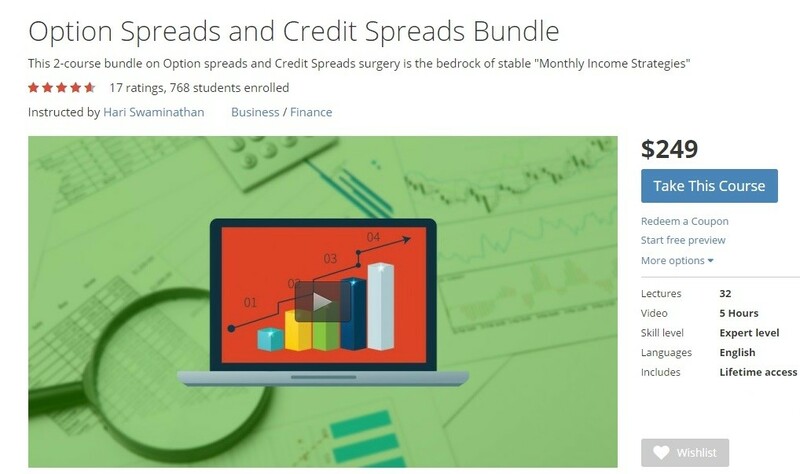 Spreads add an element of cost control and / or risk control to individual Options positions. Master the four Options Spreads, and you would have acquired a skill that can create consistent monthly income. Additionally, you’ll be well on your way to mastering the advanced Options strategies. The Bull Call Spread is an extension of the Long Call Option. When you buy a Call Option, you are bullish. The Bull Call spread maintains the bullish element of the Long Call while controlling your costs and has a limited losses profile. Of course, everything is a compromise. But you would probably be willing to make this compromise. We explain why this spread is called a Bull Call spread, and how to address any confusion from these strange names. The risk-reward profile of a Bull Call spread is very favorable. We define why the Bull Call spread is a Debit spread, and study its Profit and Loss diagrams in detail. We put a real trade on IBM and we navigate the trade for a couple of weeks. The Bear Call Spread is a credit spread, and we explain why credit spreads are a viable way to assuming an Option seller’s profile. The Bear Call spread limits your risk. We study the role of Probability in selecting credit spreads as well as implied volatility considerations and time decay. Time decay is a key component of credit spreads and the Bear Call spread can be an excellent way to generate monthly income. All spreads can be part of the busy professional’s playbook, but credit spreads can be especially attractive. We analyze the right criteria for credit spreads, including the selection of the expiry series as well as the individual Options itself. We put a real trade on Amazon (AMZN) and track, monitor and adjust this trade until its exit. The Bull Put spread is a flat to bullish that profits primarily from time decay, but can also profit quicker from a move to the upside. Its important to pick the right strike prices for the Bull Put spread, as is a thorough analysis of the stock’s chart and support levels. In this course, this is what we do – we pick Google (GOOG) as our candidate for the Bull Put, and analyze past price action, support levels and put on a successful Bull Put spread. This is a BUSY PROFESSIONALS SERIES. If you have a regular job, then you need strategies that allow you to focus on your job, but yet create a somewhat stable and reliable income stream from your investments. In this PRIMER, we dig deep into credit spreads and understand why being an Option seller (risk defined of course – no naked selling) may not be that bad after all. Consider this course as “Advanced Credit Spreads”. Both these spreads are dissected to convey an advanced level of knowledge and skill in using these credit spreads. Everything from the ideal credit spread trade setup, trade management, adjustments and exit. You’re expected to know what a Bull Put and Bear call spread is. This is a BUSY PROFESSIONALS SERIES course. If you have a regular job, then you need strategies that allow you to focus on your job, but yet create a somewhat stable and reliable income stream from your investments. The Covered Call, which we covered in Module II, is an excellent example of such a strategy. In this course, we dig deep into credit spreads and understand why being an Option seller (risk defined of course – no naked selling) may not be that bad after all. We analyze Probability, Time decay and Volatility considerations and come up with some pretty good stuff. These spreads form the foundation blocks of “Monthly Income” strategies. And not surprisingly, all advanced strategies like Iron Condors or Backspreads use some variation of the Bear Call or the Bull Put spreads. Anyone wanting to create a consistent monthly income of 2% to 5% will use these strategies as part of their “Income” portion of their portfolio.